Installment Loans: You apply for an installment loan when you have got long-term financial needs to cover. Some of the ideal instances during which you find such loans to be handy are auto bill payments, home mortgage clearances, and medical charge settlements. Payday Loans: Are you in need of quick cash? Get the money credited directly to your account with a single click of the mouse. Borrowers apply for a payday loan during classic instances such as avoiding late payment charges on credit card and taking care of unexpected situations such as accidents and escaping from unnecessary late payment charges on utility and other such bills. Installment Loans:Each borrower gets a loan amount that ranges between $1,000 and $10,000 generally depending upon personal criteria. Approaching a seasoned lender to ensure everything an effortless process is essential. Payday Loans: A loan amount anywhere between $100 and $1,000 is available readily once a borrower becomes eligible. Online processing of payday loans makes them to be more reliable for borrowers in comparison to other loan types. Installment Loans: These loans offer maximum flexibility of repayment that no other loan could offer. Typically, the payback period could be set in equal amounts for a couple of months or could be extended for over 30 years. 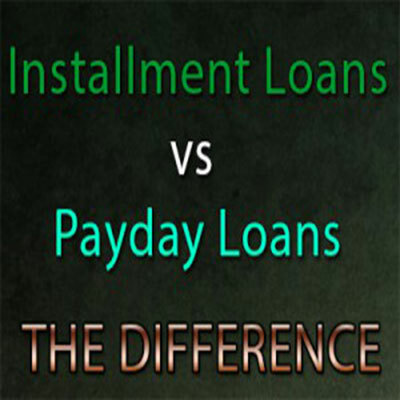 Payday Loans:In comparison to installment loans, payday loans come with a strict repayment policy. The trick here is the shorter your borrowing period is the lesser your interest payment amount will be. You can check a date to repay that is few days away or several months ahead, which depends upon the amount you borrow and your repayment capacity. Installment Loans: Though maintaining a good credit score is necessary owing to financial reasons, it hardly poses any problems in case of an installment loan. It is because such a loan is obtained on the basis of financial capabilities of borrowers who need to repay and not on their negative credit score details. Payday Loans: These loans may or may not require a positive credit score based upon the norms set by your lender. However, the credit score will be badly affected in case the loans are not repaid on time.